Custom work – ya we do that! So we had a customer get ahold of us and want their existing 2.2S chassis made from carbon fiber. No Problem we said. We offer that up too. While our machine is constantly running there’s always room to slide in one offs or even help bring your idea to production. Heres a customer from California that came to us with his idea. He mailed us out the pieces he wanted copied and we sat down to design it up. In the rock crawling world the majority of what we do is fabrication, its really a great part of it. What he gave us was two aluminum chassis’ sides and a delrin skid plate. Lets say for lack of better words they looked like a dremel ran wild. In the end we came out with this …….. Id call it the un-Stuck chassis’ in the Krazed Builds line of achievements. 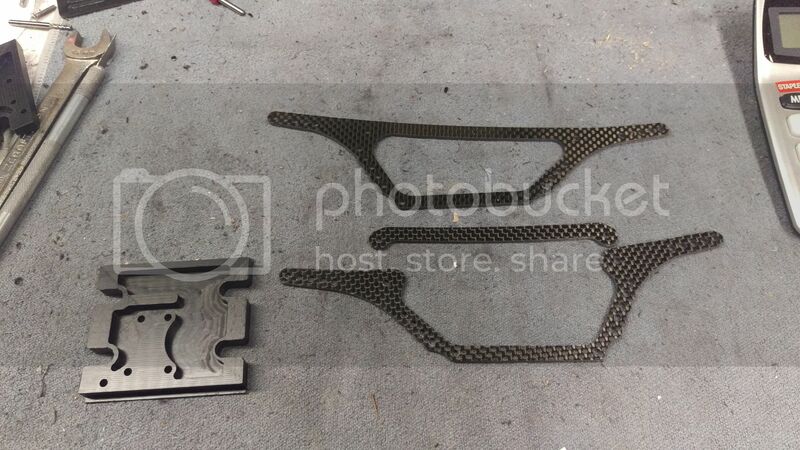 2mm 3k Carbon Fiber ……. Delrin skid pocket milled to save weight, Drilled to use Hulkster transmission and our little touch of adding a spot and half drilled holes for the Axial transmission.